Taoism is a religious tradition that began in China about 2,500 years ago—at about the same time Confucius lived. While Confucius was interested in how people treated one another, Taoism is a spiritual philosophy that focuses on a person’s outlook on life and the world around them. Taoism is practiced today in China, Taiwan, Hong King, Singapore, Japan, and Thailand, but there are Taoists throughout the world. Taoists believe that humankind, nature, and heaven are all interconnected and that harmony exists when everything acts according to its own nature. Living in harmony with one’s own nature is known in Taoism as wu wei. A person who practices wu wei avoids aggression and bends to accommodate life’s problems rather than break under their weight. A Taoist strives to live in harmony with the natural order. The natural order is an unknowable force called the Tao. Tao can be translated as “the way." Taoists view the Tao as the connection that makes all life and movement in nature possible. They believe that when a person lives out their life on earth, the Tao returns them to heaven. The Tao is composed of two opposite energies called yin and yang. Taoists believe everything in existence has the characteristics of both the yin and the yang. The yin is cold, dark, and mysterious; it is associated with the earth and is female. The yang is warm, bright and positive; it is associated with the heavens and is male. The interaction of yin and the yang are revealed in changes. These changes include the seasons along with the flowering of living things and their eventual decay. Taoists believe earthquakes, floods, and tornadoes are the results of disturbances of yin and yang, but they believe, in time, the Tao will reassert itself and order will return. Unhappiness in life comes from people acting against the Tao by disrupting the natural order of life. Taoism developed during a period of disorder in Chinese history we call the Age of Warring States. Local warlords engaged in battles; greed was rampant and many Chinese people lived in a constant state of fear. Legends say the founder of Taoism is Lao Tzu, though it is possible he never existed. Lao Tzu is said to have been a scholar who worked as a keeper of records for a Chou lord. Lao Tzu was unhappy with moral decay of his time, so he withdrew to his home to think about the meaning of life. Lao Tzu’s meditation made him a very wise man. Once, while traveling, a gatekeeper recognized Lao Tzu and asked him to write down his wisdom. According to legend, Lao Tzu wrote the Tao Te Ching, then rode through the gate, never to be seen again. The Tao Te Ching means “the Way of Life." It is a very short book—an English language translation is 128 pages. The Tao Te Ching recommends bending to accommodate rather than breaking under the stresses of life. The book discourages learning or ambition, instead stressing that we should live according to our nature. It places nature above culture, and a solitary individual above society. According to the Tao Te Ching, inaction is better than action. By allowing events to unfold according to their nature, a person has challenged the Tao. Many Taoists compare the Tao to water. When it is restricted, water seeks the weakest spot of any obstruction and applies constant force until it is free. Given the slightest opening, water will pass through and will widen the opening if possible. Water always seeks to do the easiest thing for as long as it can. The Tao Te Ching says, “there is nothing stronger and weaker than water, any yet there is nothing better for attacking hard and strong things." 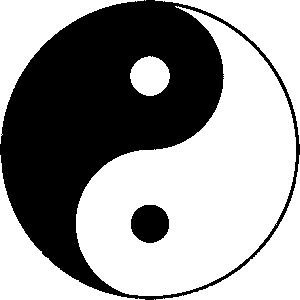 The primary symbol of Taoism is a representation of the opposite forces of yin and yang. How Do You Pronounce Taoism? Taoism is pronounced as if the T were a D. It is equivalent to the first syllable of Dowling. Derek Lin provides an explanation at taoism.net. 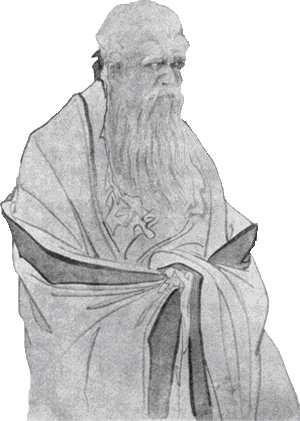 Lao-Tzu was the reputed author of the Tao Te Ching and the founder of Taoism. Although a legendary figure, he is usually dated to around the 6th century BCE. Nature is not benevolent. With ruthless indifference she makes all things serve their purpose like the straw dogs we use at sacrifice. The world is won by those who let it go, but when one constantly tries, the world is beyond one’s winning. Those who would take over the earth never succeed. When they reach to grasp it in their fingers, it is gone. What is shrunken is first stretched out. What is to be weakened is first made strong. What will be thrown over is first raised up. What will be taken away is first bestowed. The softest stuff in the world penetrates the hardest. It can enter where there is no room for it.